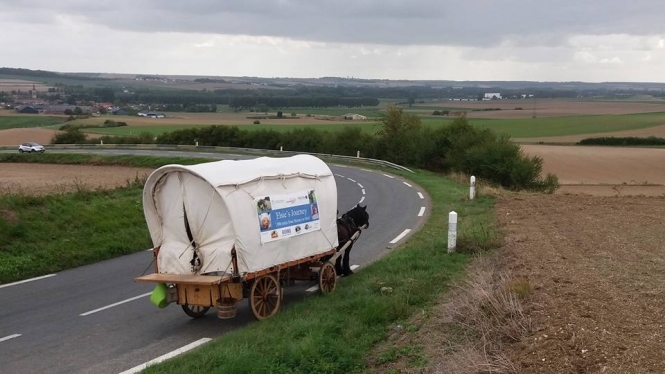 A British couple travelling across England and France in a horse-drawn wagon to raise money in honour of their late baby daughter has reached Picardie, near Amiens. Emily and Phill Gregson - who are currently in the Picardie region, near Amiens (Somme, Hauts-de-France) ahead of arriving in the Oise - set off on July 20. They have been travelling from their hometown of Liverpool, with a view to finishing their 1 609km journey in the Camargue, south of Arles (Bouches-du-Rhône). The latter section of the journey will see the couple following the river Rhône. They shared their most recent screenshot of their progress via their Facebook page, below. At the time of writing, they have so far raised over £2 250 (€2 450). The couple decided to undertake the unusual journey after their daughter Elsie died of the genetic condition mitochondrial disease, at just one month old, in November 2016. All money raised via the duo's online page will go towards the hospitals that cared for Elsie - the Liverpool Women’s Hospital, Alder Hey, and the Claire House Children’s Hospice - and other charities that helped her during her short life, and that continue to help people affected by the disease. Elsie was born with the condition - with doctors still not sure why - and was never able to move her body or limbs. Her condition deteriorated until nothing more could be done for her. After her death, the couple - who also look after Phill's son, 13, from a previous relationship - hit upon the idea of the journey as a way to move more, get out of the house, and see a way forward after the tragedy. As a master wheelwright (a specialist in horse-drawn vehicles), Lancashire-born Phill has built and maintains the wagon, while qualified veterinary surgeon Emily looks after the horses. The couple has also been relying on the generosity of strangers along their journey.